AdFicient.com is an advance Search Engine Marketing Agency based in St Louis, Missouri that specializes in Pay Per Click advertising. They are a Google Certified Agency and manage approximately 20 million dollars in advertising per year. AdFicient is unique in many respects and has earned a stellar reputation over 11 years while serving thousands of clients. In this age on Internet marketing, search engine marketing companies are cropping up daily – yet few are able to deliver on a consistent basis. 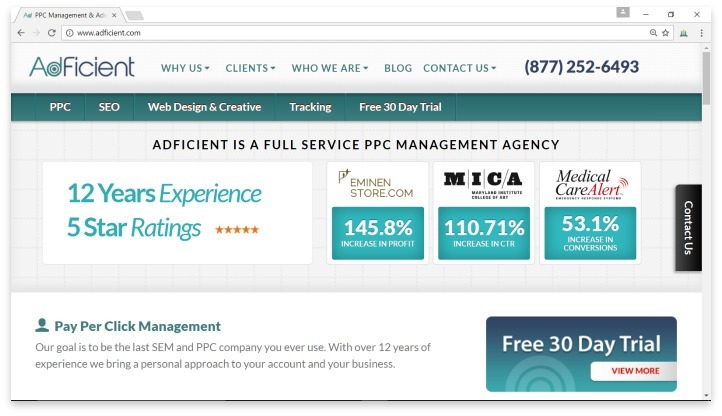 AdFicient was founded by Chris Hickman – one of the foremost authorities on PPC in the United States. We’ve reviewed multiple PPC agencies and most provide services which are almost entirely software and automation. In many cases it is virtually impossible to reach a live human being to discuss your account. AdFicient’s approach is to speak with each client and customize a plan to maximize the opportunties PPC provides – for the best possible results. Reviews from past AdFicient customers are universally positive, with many giving highest praise and some even going so far as saying AdFicient saved their business. Additionally, nothing speaks to a companies ability to deliver what they promise stonger than a free trial… and that is exactly what AdFicient customers get. If you appreciate the value of effective PPC campaigns but simply don’t have the time or expertise to do it right in-house, we highly recommend AdFicient. They will schedule a phone conversation to review your current situation and get a clear understanding of your goals – then provide you with a plan of action backed by a risk free guarantee of results. In addition to low (if any) set up costs and no long term contracts, AdFicient provides personal service available 24 hours per day, 7 days a week. AdFicient scores the highest BRAND REPUTATION metric of any company we have reviewed to date. Have you had an experience with this company? Please share your AdFicient reviews below. Our adwords cost per conversion had been increasing for years when we turned to adficient for help. In a matter of a few months conversion costs were lower without any drop in quantity or quality of the leads.